Ever since it was announced that Dr. Ian Malcolm would officially return to Isla Nublar in Universal’s forthcoming Jurassic World: Fallen Kingdom, his idiosyncratic portrayer, Jeff Goldblum, hasn’t been able to keep his mouth shut regarding the possible return of another Jurassic Park alum, the quick-witted paleontologist, Ellie Sattler (Laura Dern). Last week, Goldblum was singing the praises of his co-star to Entertainment Tonight and did everything in his power not to blurt out the truth about whether or not Dern would indeed be returning to the dino universe. Fortunately for fans, he isn’t exactly one for subtlety. 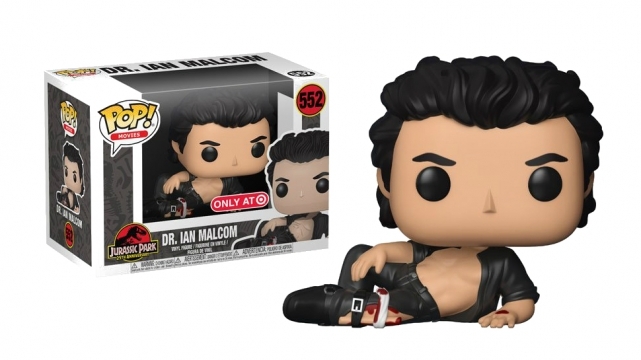 The chaos theorist – perhaps best remembered for a T-Rex-related injury that left him immobile and shirtless, which you can now own in an immortalized Funko Pop (see pic below) – was revealing hints as big as triceratops droppings. The sequel to 2015’s Jurassic World, which earned an astounding $1.6 billion worldwide, Fallen Kingdom will see Chris Pratt and Bryce Dallas Howard reprise their roles alongside returnee Jeff Goldblum. Beyond that, we know that the film will be helmed by J.A. Bayona (The Orphanage, A Monster Calls) and co-written by Colin Trevorrow. Jurassic World: Fallen Kingdom is currently slated for a June 22nd release and barring some unforeseen disaster at the global box office, Universal plans to get the gang back together for a third and final film – one that will presumably be with us in 2021. Surely by that point Isla Nublar’s geneticists will begin to realize that hybrid dinosaurs aren’t a very good idea? We can only hope.